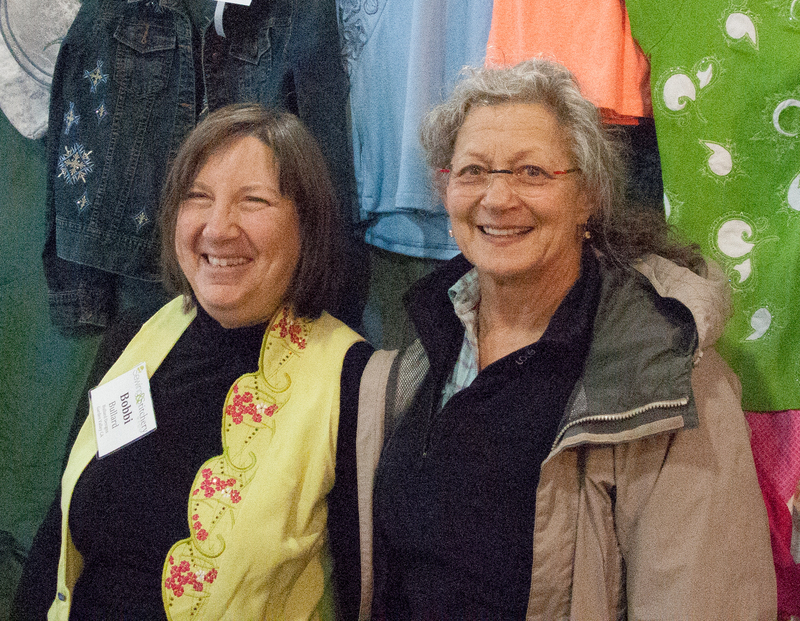 I recently had the good fortune to go the Sewing & Stitchery Expo in Puyallup, WA, with my friends Mary Ann Donelley, Kathi Mundt and Cheryl Churchill. While we waited at the airport, I taught Mary Ann how to knit. Okay, so I have a loud voice. And our plane was delayed. So one by one, I was approached by people who wanted to learn how to use the Fix-A-Stitch to repair their stitches. Since I was on my way to a sewing expo, I didn’t have a sample to demonstrate … so I kept ripping down on Mary Ann’s new scarf. But of course, since I used Fix-A-Stitch to make the repairs, it doesn’t show. While Mary Ann was getting started, she dropped one of her cast-on stitches. No surprise that I easily picked it back up using Fix-A-Stitch. Watch for a new video about how simple it is to make that repair, now that we have Fix-A-Stitch! 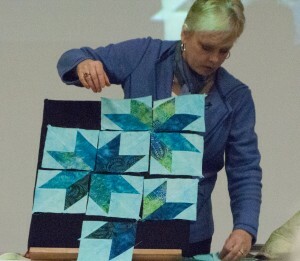 • In my classes I was very impressed with Nancy Zieman of Nancy’s Notions. She believes in keeping things simple. 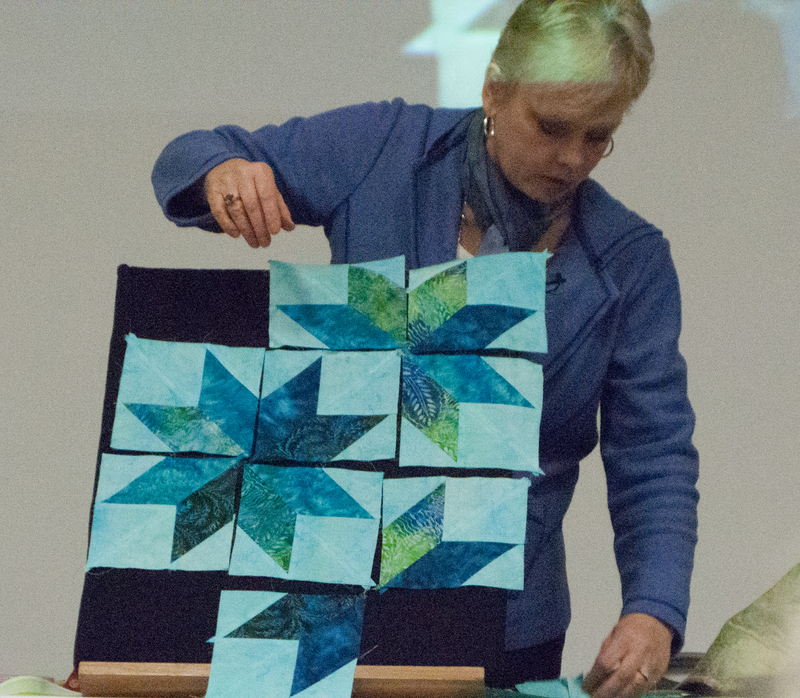 After the talk, I learned she’s a knitter — and samples of Fix-A-Stitch are on their way to her. • It turns out that the lace Fix-A-Stitch is PERFECT for threading both the Baby Lock 10 needle embroidery machine and their Crown Jewel long arm. • A seminar on “365 Days of Notions” introduced me to so many wondrous things to add to my own collection that I had to leave my shopping list with The Pine Needle so they could ship it all to me. I’m especially excited about a light table I can use for my appliqué work, as well as my piles and piles of photo negatives that still need reviewing and culling. There were many wonderful vendors at the Expo. I was delighted to see Great Yarns there — they always have amazing knitted items to drool over (oh, how I wish I had time to knit!). And of course, Makers’ Mercantile was there with all of their wonderful offerings. In the non-knitting department, I visited with friends from ThimbleCreek (I hope Joe has time to get us a newsletter this week, now that the show is over), and made friends with Bobbi Bullard. After listening to her speak, I was certain we have a connection, which it turns out we do: We were both raised in Atlanta, Georgia … about the same time … and even have some mutual acquaintances. One of the most impressive speakers I’ve heard in a long time was Tula Pink, a young (32) fabric designer with enough stage presence to be a stand-up comic. She kept us enthralled for over 2 hours. 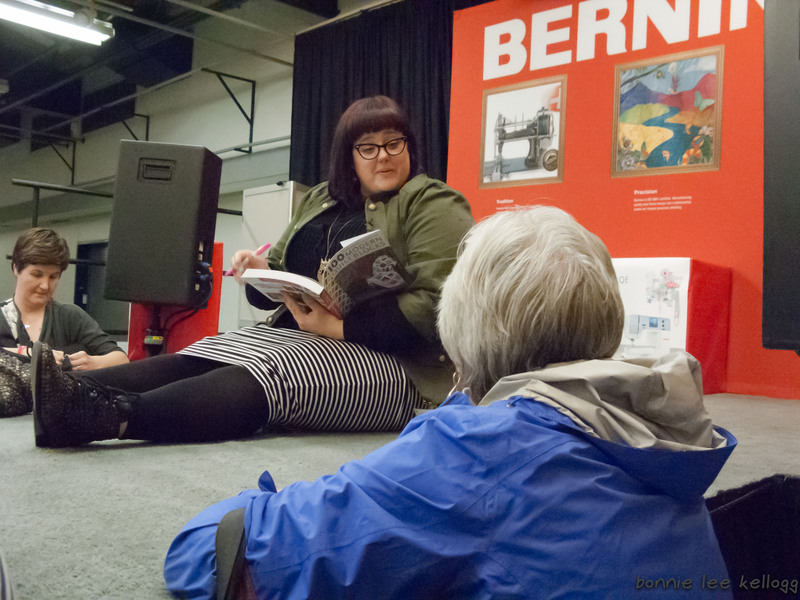 When Mary Ann went to get a book signed for her daughter, I was able to move in close enough for a photo. At the airport on our way home, I spent some delightful conversation with Jiordan Castle, a young writer now living in San Francisco. I gave her a card, and hope she will be in touch so we can continue our discussion of books and movies and other fun stuff. Check out Loop’s Instagram contest… featuring Fix-A-Stitch! Where to buy our new bags!